As the holiday season approaches, Pediatric Dental Healthcare is working to make sure that the wishes of needy children come true! The Toys for Tots program has traditionally been one of the most nationally recognized non-profit programs in the United States. From its inception in 1947, the program has continuously provided a means for needy children. 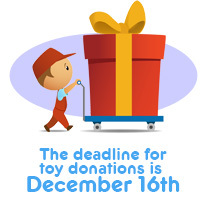 As an official drop site for Toys for Tots, please bring new, non-violent, unwrapped toys to our office. These toys will be distributed to needy children in the community. There is nothing more satisfying than seeing the smile of a child during the holiday season. Thank you for your generosity.